These promises, made to the Jewish community more than 200 years ago, underscore the ideals of pluralism on which this nation was founded and are part of the fabric of our Museum. Washington’s words remind us that we must be vigilant: the freedoms to which all Americans aspire must not be taken for granted and we must constantly work to attain and sustain the freedoms defined in these founding principles. May we strive to make Washington’s vow a reality in our own time. We invite you to show your support on social media with #ToBigotryNoSanction. Based on material culture from the Museum’s collection, the lessons in this national curriculum challenge students to exercise critical thinking and inquiry-based learning skills while exploring the American Jewish experience. In the spirit of traditional Talmudic study, Open Book invites students to approach the study of history in unexpected ways and connect what they learn to their own ideas, experiences, and passions. This open-ended process of discussion and discovery empowers students to see themselves in the larger story of American Jewish life and inspire a sense of pride and connection to their heritage. Free lessons are available for download here. Religious Liberty, by sculptor Moses Jacob Ezekiel, is an allegorical work in which each figure symbolizes an abstract concept. The main figure represents liberty, and she holds her right arm protectively over a young person who represents religious faith – he reaches toward the heavens and holds a burning lamp in his hands. An eagle at the base of the statue crushes a serpent and looks to the horizon, suggesting America’s continuing struggle against intolerance. The sculpture is cited outside of the Museum on the corner of 5th and Market Streets. 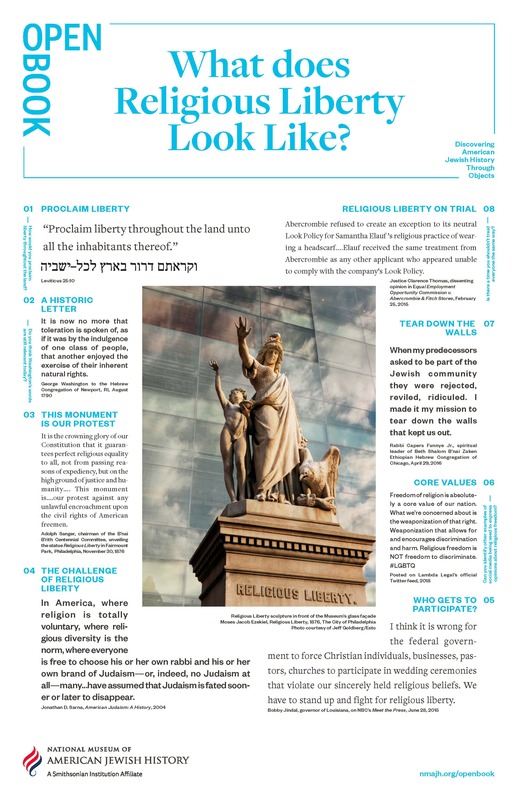 To learn more about the sculpture, visit Religious Liberty. 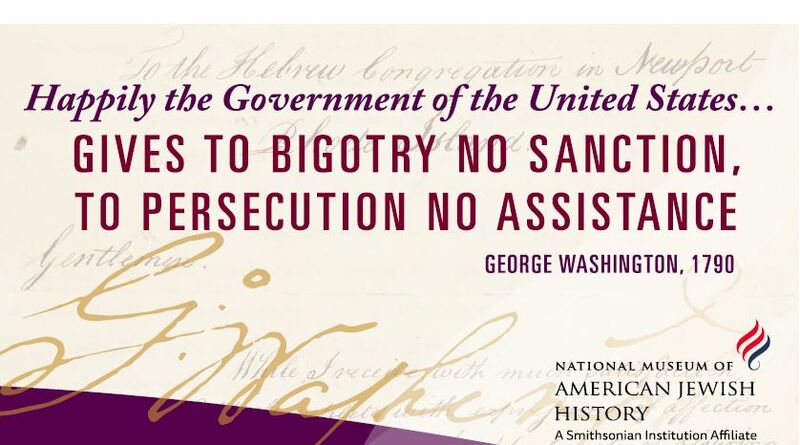 Visit sites with connection to To Bigotry No Sanction exhibition, all right here, in historic Philadelphia.